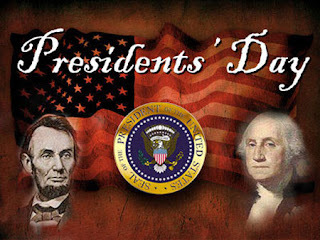 Presidents Day (also called Washington's Birthday) is celebrated in the USA on the third Monday of February. It is a Federal holiday in the USA. George Washington's birthday was originally designated a national holiday in 1885, but its date was changed by Congress in 1971. The official US holiday is meant to honor only George Washington, but many people consider President's Day a day to honor both George Washington (born on Feb. 22, 1732) and Abraham Lincoln (born on Feb. 12, 1809). (content taken from Enchanted Learning). Here are some links to some fun and easy crafts for the kids to do to honor Presidents' Day! Most of them are very simple and involve things you can find laying around your house. There are also worksheets to help teach kids what Presidents' Day, along with George Washington and Abraham Lincoln, are all about. Enjoy! Please refer to our Calendar of Events page for a complete listing of events going on for Presidents' Day this year.